1. Somebody somewhere writes that the position of Democratic Commissioner of the Board of Elections comes, “with a $135,000 annual salary and with no requirements to hold regular office hours.” False. The salary is closer to $105,000, and the hours take into account that the person is a professional and an executive of a large public organization. 2. This same outlet claims that Tonawanda Democratic Committee Chair Gayle Syposs is “likely” to be the Democrats’ pick. False. Syposs is not likely to be the Democrats’ pick. It’s more likely to be Champ Eve or Mike Keane, and all of it is subject to an executive committee meeting that will likely take place in late October (it must be within 30 days of the Dennis Ward vacancy), and then subject to county legislative approval. Facts are sometimes easy to just look up. Speaking of Paladino, several of the 2010 Republican candidate for governor’s companies recently dropped $9,000 on Erie County Democratic Chairman Jeremy Zellner’s housekeeping account, according to campaign finance records. This occurs even after Zellner moved Democratic Headquarters out of Paladino’s Ellicott Square. Who better to lecture Patrick Lee and Anthony Gioia on who is and isn’t a “RINO” than a self-anointed tea party hero who has given thousands of dollars to Democrats in just the past year? As I grasped your handle and cupped your lean, strong shaft of a body in my left hand, I silently celebrated all of the times, over all of the years, we had done this together. Donn Esmonde, to his snow shovel. I think the shovel swore out an order of protection. From the Harvard Business Review, “It’s Not OK That Your Employees Can’t Afford to Eat“. It wasn’t that long ago that in most companies, especially large ones, a fair amount of time was spent worrying about whether the company’s practices towards employees were fair. One of the functions of human resource departments was to advocate for the interests of employees. …A family of four with one breadwinner is eligible for food stamps if they earn less than $2500 per month. That is the equivalent of a $15 per hour job and a 40 hour work week. The government has determined that full-time workers earning less than that do not have enough money to feed their families on their own. If that breadwinner earns less than $16 per hour, they are also eligible for Medicaid assistance to provide healthcare. Depending on where they live, that breadwinner is also eligible for subsidies to help pay for housing. Pre-haunting Scrooge is no way to go through life, and no way to run a country. 1. This morning, Channel 4 kept teasing a story about pop idol Justin Bieber having written or said something inappropriate at the Anne Frank House in Amsterdam. Curious, I Googled it. It was about as dismissively disrespectful as you’d expect from a boy who dresses like this to meet the Canadian Prime Minister. I then turned the channel, because teasing a story in this day and age insults my intelligence. 2. 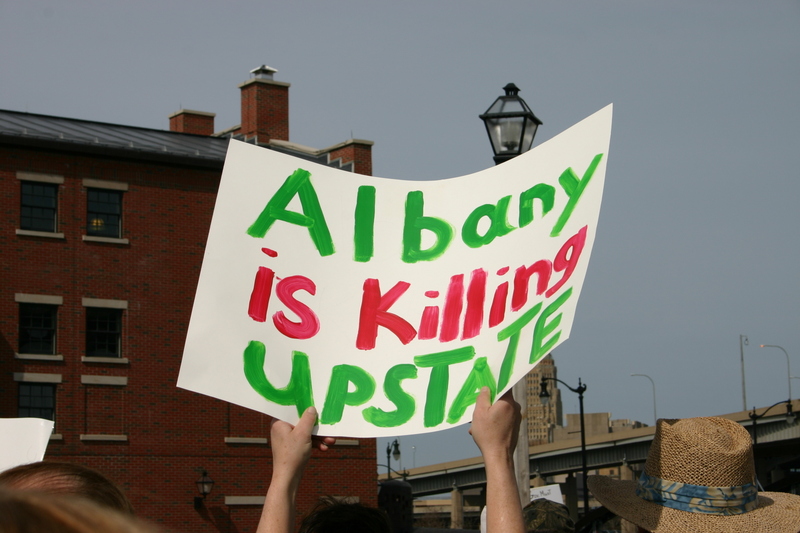 Western New York Democrats are divided into factions. This is newsworthy because a Cheektowaga political club has endorsed a neighboring city’s caretaker Mayor. Bob McCarthy is here to tell us this, and to transcribe what people have to say about it, and leaves us with a quip from more than 10 years ago. Insightful! 3. Donn Esmonde has wonderful things to say about the positive effects of the Buffalo-Niagara Medical Campus. Except when it comes to maintaining, e.g., the Trico factory as a Maquiladora memorial. 4. You know the relentless marketing blitz for that “Shen Yun” dance thing you’ve seen everywhere now for the past few months? It’s propaganda for a cult. One that’s been brutally oppressed by the Chinese Communists, but a cult nonetheless. 5. A letter-writer to the News makes the case for Paladino’s ulterior motive in running for the Buffalo Board of Education. You knew there had to be one. 6. Stop picking up “WNY Family” Magazine at your local pediatrician’s office, supermarket, or day care. Someone wrote a completely false and misleading article alleging that Gardasil, the HPV vaccine, is dangerous. Every medication comes with risks, but contracting the very contagious human papilloma virus increases a girl’s risk of eventually suffering from a variety of cancers. Here is the body count for the anti-vax paranoia movement. The author stands by the story, so that paper is dead to me. 7. Surprise! Indefinite detention of people, kept incommunicado and without trial or charge at a third-world military base might engender some bad results. America should put these people on trial or release them to their home countries. It’s long since time that they could have legally been tried within our regular criminal system. Guantanamo Bay is the most un-American thing we’ve ever maintained for this long, and all it is now is a recruitment device for more terrorists. I’m not saying these are all great people whom we should release on the streets of Miami with a driver’s license and $500 cash. I’m saying there are right ways and wrong ways to deal with criminals or terrorists. Indefinitely detaining them without trial or charge is a “wrong way”. It is a massive national shame and goes against every single thing we purport to stand for; it violates everything we’re supposedly protecting by maintaining it. In other news, Spring might actually arrive this week.